The Roman Catholic Dioceses of Kerala and Tamil Nadu had announced in 2008 that they would be producing a film on the life and times of St. Thomas, wherein they would depict Thiruvalluvar as a disciple of St. Thomas. Later, as confirmation of the unholy Christian-Dravidian nexus, Tamil Nadu Chief Minister Karunanidhi graced the occasion of the said film’s inaugural function as Chief Guest. Though himself an ‘expert’ on the Thirukkural, Karunanidhi chose to participate in the inauguration of a film falsely portraying Thiruvalluvar as a disciple of St. Thomas, a complete concoction and an audacious expression of extremist evangelism. Close on the heels of the above said inauguration function, Deivanayagam organized a four-day meet titled, “Thamizhar Samayam – Muthal Ulaka Maanaadu” (Tamil Religion – First World Conference), from August 14-17, 2008, under the aegis of Dravida Anmeega Iyakkam (Movement of Dravidian Spiritualism), a movement started by him to spread the canard called “Thomas Christianity”, in the name of “Adi Christhuvam” (Early Christianity). The event was backed by the Mylapore Archdiocese which hosted the event in its own premises in Santhome near Mylapore. – Adi Christhuvam (Early Christianity), promulgated and established in Tamil Nadu by St. Thomas, is the original religion of the Tamils. – The Aryan invaders distorted Thomas Christianity and conceived new concepts called Shaivism and Vaishnavism and hence they must be treated as sub-sects of Thomas Christianity. – The ‘holy trinity’ concept has beautified Indian Religions. The ‘Holy Spirit-Father’ combination can be identified with ‘Ardhanarisvarar’ and ‘Sankaranarayanar’ formations. – St Thomas’s teachings abound in Thirukkural and Sage Thiruvalluvar was a disciple of St Thomas. – The Hindu practice of applying ‘sacred ash’ on the forehead actually started from ‘Ash Wednesday’ the first day of the ‘Penance’ (Lent-days). The sacred ash comprises within it all the three stages of ‘Death, Resurrection & Pardon due to the fact that the ‘ash’ cannot be destroyed, as the resurrected body cannot be destroyed. – ‘Thiruneetru Pathigam’, a collection of Shaivite Hymns sung by Sage Thirugnaana Sambandhar comprises a number of messages of Christianity. – All Shaivite literatures namely ‘Thirumurai’, ‘Thevaram’, ‘Thiruvasagam’ and ‘Thirupathigam’ do not talk about the four Vedas namely Rig, Yajur, Sama and Atharva; as they carry the messages of Christ, the ‘Bible’ is the only ‘Veda’. Inculturation, as a strategy, is planned well and executed meticulously through institutes which are exclusively created for the evil purpose. They operate in educational, social, spiritual and fine arts fields. “Jnana-Deepa Vidyapeeth” may sound like a Hindu institution. But the fact remains that it is a Christian Institution blatantly indulging in Inculturation. Attempting to give a Hindu colour to its emblem through Katopanishad saying that the tree in the emblem denotes or represents asvatha and the meditating figure is seeking Brahma-vidya, the institution finally underlines that, all the components of the emblem merge at the summit in the cross of Christ which, as the linchpin of time and eternity, interlocks the human and the divine. The institute says its mission is to foster an integral understanding of the human person which mediates the vision of Jesus for India. Apart from such educational institutions, other institutions operate exclusively for Inculturation. The best example is “Shantivanam”. Dedicated to the “Holy Trinity” Shantivanam was founded in 1950 by two French Priests Fr.Jules Monchanin, a diocesan missionary and Fr. Henry leSaux (Abhishiktananda) from the Abbey of Kergonam. They named it as Saccidananda Ashram, equating “Sath-Sith-Ananda” with the “Holy Trinity”. 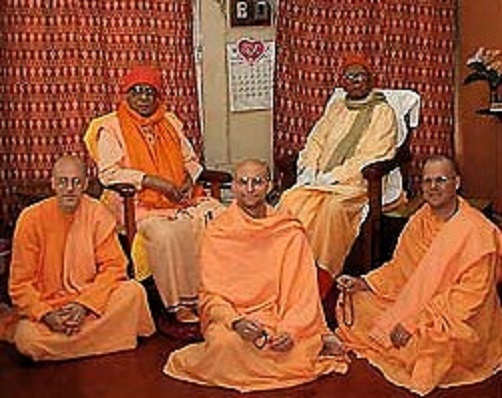 Later Fr.Bede Griffiths, who had come to India in 1955, took charge of Shantivanam in 1968 on the invitation of Fr.Henry leSaux, after short stints at Bangalore and Kurisumala in Kerala, where he changed his name as Dhayananda wearing saffron robes. He made Shantivanam a center of Inculturation and Inter religious dialogue. The Saccidananda Ashram inside Shantivanam has a Temple inside. The entrance and the Temple have been built in the form of Hindu architecture with sculptures of various Christian Saints. One “Cosmic Cross” is also placed. The Ashram spends a lot of time and money for “Academic Reasearch” on Inter religious understandings and meeting points, encounters of Christianity and Hinduism, Christian Vedanta, and many other inculturation and interfaith stuff. Even after the demise of Fr.Bede Griffiths, the institution continues its inculturation works unabashedly. Jesuit Priests, whose mission is to destroy Hinduism to establish Christianity, visit here from abroad and some of them are very frequent, almost every year. If Shantivanam is for “academic research”, yet another institution has been established exclusively for fine arts, by name “Kalai Kaviri College of Fine Arts” in Trichy. Having nationally accredited with Grade A by NAAC (National Assessment and Accreditation Council) and also recognized by the Government of Tamil Nadu, the institution has tasted success in Christianising the divine Hindu art of Barathanatyam. Apart from Barathanatyam, it also focuses on instruments such as Mridangam, Veena and Violin. The classical music and dance are being taught on Christian (Bible) Themes with the main objective of Christianising them. The Church’s hold on Dravidian parties of Tamil Nadu is so much that this institute Kalai Kaviri is patronized by DMK as well as the AIADMK governments. While the DMK government allowed this institute to play a major role in “Sangamam” festival organized between 2008 and 2011, the present AIADMK government allows it to play a major role not only in its Christmas celebrations but also festivals of Temples like Srirangam Ranganathar Temple which was in the Chief Minister’s own electoral constituency until she was sentenced in accumulation of disproportionate assets case. As if this is not enough, we have a few cults here in India itself, which do not want to identify themselves as “Hindu”. The globetrotting Corporate Yoga Masters, who lead these cults, dress and make up themselves to look like “Jesus”, in order to sell their yoga globally. When one hears these Yoga Masters speaking, one could feel as though listening to Christian Preachers. Other such Corporate Gurus in India keep their doors open to foreigners and accept them as their “Sishyas” without proper verification. Knowingly or unknowingly, they allow some of their foreign disciples to deliberately misinterpret our scriptures and spread them among gullible youth. It is interesting to note that the traditional time one spends on one’s education, in the Gurukul, is twelve years, and this is exactly the time of the life of Jesus of which there are no references at all in the Bible. The Hindu yoga is marketed by Corporate Gurus who want to identify themselves as “secular” or “spiritual” but not “Hindu”; foreigners flow as ‘disciples’ with huge money too; ashrams are established worldwide; round the year globetrotting; ultimately, knowingly or unknowingly they start selling Jesus themselves in India and help the cause of inculturation leading to Christianisation of Yoga. There are a few sectarian and racist Tamil outfits that subscribe to Shaiva Siddhanta and pretend it has nothing to do with Vedic Hinduism. They are opposed to Vedas and Sanskrit, easily fall prey to the Tamil card played by the Church. They are so chauvinistic that they fail to realize the damage they are causing to their own philosophy. World Saiva Council headquartered at London is one such organization, which organizes World Saiva Conferences with the sole aim of promoting Tamil Consecrations, Tamil Marriages, Tamil worship in temples, all sans Vedic hymns and Sanskrit Mantras. They also peddle something called “Tamil Agama”. “The Society of Jesus” is a Roman Catholic Religious Order, which was founded in 1540 by Saint Ignatius of Loyola (1491-1556). Jesuits, the members of this society, which is notorious for its evangelical works in the guise of charitable, educational and social services, are bound by the Vows of Apostolic Order. Saint Francis Xavier (1506-1552) was the first Jesuit to work in India facilitating the “Inquisition of Goa”. Though Pope Clement XIV (1705–1774) abolished the Jesuit order in 1773, it was reconstituted in 1814 by Pope Pius VII. And since then there is no looking back for them and they are well established in India with hundreds of schools, colleges and other educational institutes. A section of these Jesuits religiously follow the strategy of “Inculturation” introduced by Robert-De-Nobili. Two such Jesuits were Swami Amalananda and Swami Animananda, who worked in remote, poor villages in the state of Mysore. The seeds sown by such characters flourished later as Shantivanam and Kalai Kaviri.